Which Subwoofer Design Should You Choose? The subwoofer is the most specialized speaker in your home theater, generally dedicated to producing bass frequencies that are around 100 Hz down to 20 Hz. Because subwoofers use large drivers and are typically powered by their own amps, they can produce the long wavelengths of low frequencies at a higher dB level than a traditional loudspeaker. But there are a few ways to design a subwoofer and each has its pros and cons. In this article, we’ll go through the different types of subwoofers with an emphasis on the benefits and trade-offs you can expect. Ported subwoofers are fairly common as they offer an easy way to serve up thunderous slabs of thick bass. If you’re unfamiliar with speaker design, a port is merely a hole in the cabinet, usually extended inside the speaker by a tube but not always, which allows air to escape. Ported designs are also sometimes referred to as “bass reflex” speakers, as sound waves, in particular bass frequencies, are also forced out of the port along with the air. Since a port is a technique to beef up the bass coming from a speaker, it’s no surprise that it is a popular design choice in the case of subwoofers. Every port has what is called a resonance frequency, which is the frequency at which it vibrates and is mainly due to the port’s length and width. It’s the sound waves at the resonance frequency, or the ones that are close to it, that will be boosted by the port. If you were to look at the frequency response graph of a ported subwoofer, you would see that there is a peak at this resonance frequency. The speaker engineer can choose which frequencies to boost by changing the dimensions of the port, but the fact remains that only a small range of frequencies will be intensified by the port. Because of that, the perceived performance of the subwoofer can vary depending on your source material. For instance, say you have a subwoofer that has a port with a resonance frequency of 25 Hz. That will make material that contains that the 25 Hz frequency sound amazing, with resounding bass beautifully filling your room. But if you are listening to some rock music that doesn’t really have anything below 40 Hz, you lose all the benefits of that port and may wonder if your subwoofer is even powered on. Another potential drawback to a ported sub is port noise. Because all of that air is being forced out of the port, sometimes the air turbulence can cause a “chuffing” sound as it exits the cabinet. This is typically not an issue with well designed ports, but it can still happen at higher volumes. By contrast, a sealed cabinet subwoofer does not use a port, the only place for sound to leave the cabinet is from the active driver(s). The advantage is that you get a nice even response from the sub across all frequencies without any big peaks, as long as it is a well designed sub. Sealed cabinet speakers are sometimes called “acoustic suspension” designs. 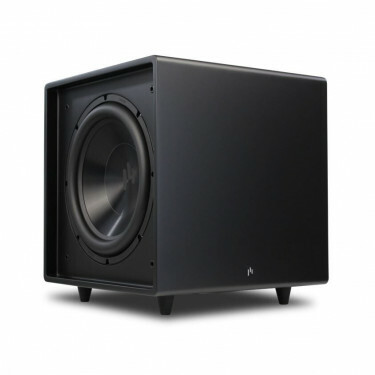 In addition to getting a more even sound from a sealed cabinet speaker, you don’t have to worry about port noise and the overall sound of the sub should be more tight and defined in comparison with the more boomy sound you get from a ported subwoofer. However, the enhanced sound quality comes at the price of sound quantity and in some cases depth. That is, a sealed cabinet may play quieter and may not be able to hit frequencies as low as a ported sub. A couple of ways to help compensate for that are a larger woofer and more powerful amp, but the first will result in a larger box. Given that another advantage of sealed subs is that without a port they can be built smaller, sealed subs don’t usually go the route of larger woofers. Sealed cabinet subs are used fairly often in car audio because filling the small space of a vehicle with bass is far easier than a large room. But for home audio use they are a little less common and may not provide the same amount of overall output and deep bass as a ported design. Here at Aperion Audio, we take a third approach which in some respects splits the difference between ported and sealed cabinet subwoofers and can offer the best of both worlds. All of our Bravus II subs use what’s called a passive radiator design. So instead of a port, they have two drivers in addition to the active driver. But those extra drivers, or passive radiators, are not wired to the sub’s amp. Since they aren’t powered by the amp, they only move back and forth as the air inside the cabinet expands and pressurizes. The passive radiators allow sound to escape from the cabinet as a port does, but with an important difference, since the radiators do not have a resonance frequency like a port, they allow a wider range of frequencies to be emitted. As mentioned, this sets up a best of both worlds scenario, the sub produces the nice flat frequency response of a sealed cabinet, but also allows for the higher level of output of a ported design. Another advantage is that because there is no need to have room for the port inside the box, we can keep the overall size of the subwoofer to a minimum. The small footprint combined with the big sound of our subs is a frequent, pun intended, compliment we get from our customers. Finally, we don’t have to worry about port noise and a passive radiator sub provides an exceptionally musical and smooth bass sound. So having gone through every design option in the past, ported with our Intimus S-8, S-10 and S-12, passive radiator with the S8-APR and even a dual driver sealed cabinet with the Bravus I, we feel that the passive radiator option offers the most optimal design that provides great sound without having to compromise on overall output. Having said that, we encourage you to audition and listen to as many subs as you can when you are shopping around to find what works best for you in your set up. If you are on the hunt for a new sub, the most important things to keep in mind are your room size, that is to buy a sub that can fill your space, and to also purchase one that will give you the sound quality that you prefer. We hope this look at subwoofer designs has deepened, pun also intended, your understanding of how they function and the benefits of each. As always, we wish you happy listening!